According to a 2016 report by the Council for Scientific and Industrial Research (CSIR), South Africa’s total technical wind power potential is so great that if wind farms were to be installed across the country (with the exception of exclusion areas such as national parks), as much as 6 700 GW of power could be generated – enough electricity to supply the whole world. In South Africa, says Greg Landwehr, principal engineer: energy supply forecasting, at the CSIR Energy Centre, the utility-scale renewable energy market is made up wholly of the Department of Energy’s Renewable Energy Independent Power Producer Procurement (REIPPP) programme – a competitive bidding process used by the government to procure renewable energy generation capacity. The programme attracted investment from prominent global renewable energy project developers and Tier 1 component manufacturers, he says. ‘It has done so because of the size of the market, the programme’s transparency and strong government support. Global leaders such as Abengoa, Mainstream Renewable Power and Juwi, as well as South African developers such as Pele Green Energy, Aurora Power Solutions and BioTherm Energy have entered the market,’ he says, adding that the programme has attracted up to ZAR194 billion in investment. 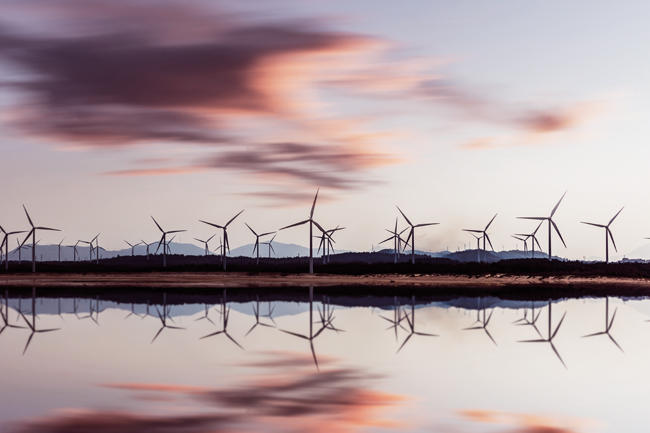 Dinesh Buldoo, director of power at WSP Africa, argues that ‘before, the wind sector was often met with sceptical questions on how wind energy could be a suitable energy source for South Africa. Today, it is clear there is great potential’. As part of the REIPPP, South Africa plans to install 8.4 GW of wind power by 2030 – complementing other initiatives such as solar, biomass and mini hydro projects, he adds. Despite this immense potential, however, the industry has faced a plethora of challenges, most notably surrounding policy, which brought it almost to a standstill. ‘As the past two years have proven, policy uncertainty is a key challenge for South Africa’s renewable power sector,’ says Martin. However, she adds, it is anticipated that the 2 206 MW of power procured in rounds 3.5 and 4 by the end of 2015 will achieve financial closure shortly, so that construction can begin by the end of 2018, or early in 2019 at the latest. Indeed, in early March, Minister of Energy Jeff Radebe announced that the 27 outstanding power purchase agreements (PPAs) would at last be signed. However, the actual date of signing has again been delayed, this time due to interference from the National Union of Metalworkers of South Africa and Transform RSA. Renewables, says Greg Austin, MD of Juwi Renewable Energy South Africa, ‘are the cheapest form of energy in South Africa because we have such wonderful resources. However, we’ve got a regulatory environment that – not intentionally – disadvantages renewables’. Given the policy ambiguity, he argues that South Africa is currently not doing very well as far as tapping its renewable resources is concerned – a great pity considering the good start the country made, he says. Moreover, investor confidence has taken a hit. Beyond South Africa’s borders, the rest of Africa is embracing renewable energy. The need to improve electricity supply via environmentally friendly and sustainable technologies has seen renewable energy plants mushroom across the continent, all set to more than quadruple output by 2030 to 22%, according to Standard Bank. Somalia, says Buldoo, has the highest onshore potential of any country, followed by Sudan, Libya, Mauritania, Egypt, Madagascar and Kenya. He adds that there is also considerable offshore wind energy potential off the coasts of Madagascar, Mozambique, Tanzania and Angola. As many as 140 wind farms are expected to be operational across Africa by 2020, bringing 21 GW to power grids across the continent. 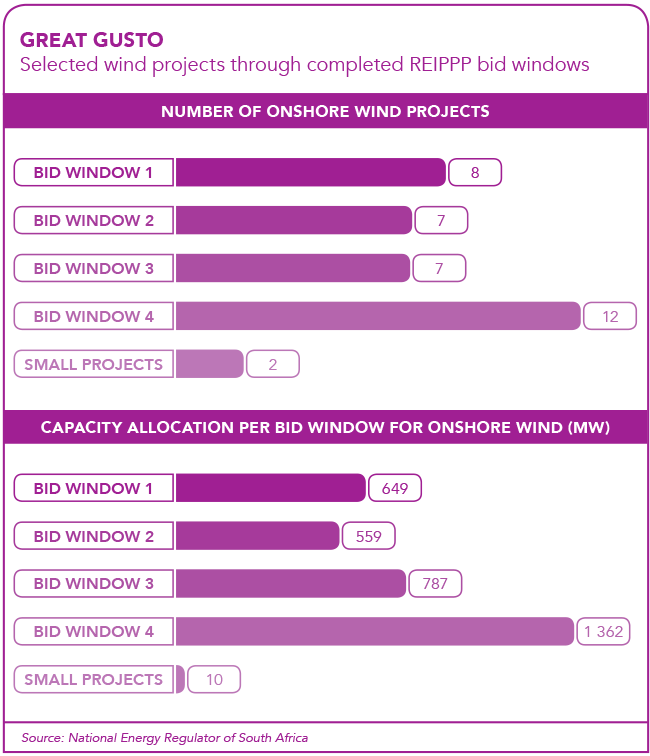 This includes wind farms currently being developed in Morocco, Egypt, Cape Verde, Kenya, Ethiopia and Tanzania. ‘This is certainly testament that wind is taking its rightful place in the African electricity-generation arena,’ says Buldoo. Morocco’s Tarfaya wind farm is one of the largest on the continent, adding 301 MW of electricity to the country’s grid through 131 turbines – enough electricity to power 1.5 million households. Tarfaya is also one of several wind farms that will be built under the Moroccan government’s Integrated Wind Energy project. The country committed to investing US$3.24 billion into growing its energy generation capacity from 280 MW (in 2010) to 2 000 MW by 2020. Egypt has impressive national plans to install 7 GW of wind power by 2020. The 720 MW Zafarana wind farm in the country’s desert region, 120 km south of Suez, is situated in one of the windiest parts of Africa. 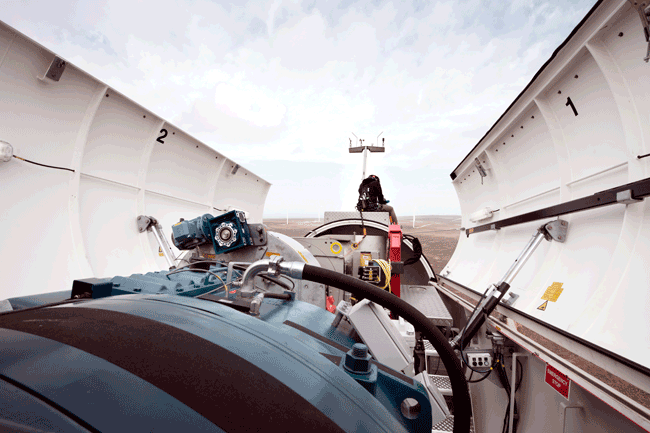 Zafarana has 50 wind turbines, all of which can produce 600 MW of electricity. Kenya’s Lake Turkana wind farm can generate 850 kW of energy through each of its 365 turbines – a combined output of 310 MW, approximately 17% of Kenya’s installed energy capacity. And Namibia’s Diaz wind farm will add 44 MW to the country’s national grid once it is complete. African countries, argues Martin, could look to South Africa’s REIPPP lessons to leverage similar foreign direct investment and local economic development potential. ‘In addition to South Africa, countries such as Egypt, Kenya, Morocco, Senegal, Madagascar, Rwanda and Mali have adopted national policy for renewable energy,’ she says.